The R-PLEX Human RANTES Antibody Set includes a matched capture and detection antibody pair and calibrator for the quick and easy measurement of RANTES in biological samples. R-PLEX products leverage MSD’s electrochemiluminescence technology for better sensitivity and a larger dynamic range than traditional ELISAs. R-PLEX matched antibody sets enable the development of singleplex and multiplex immunoassays. Individual assays may be developed using MSD avidin- or streptavidin-coated plates. Custom multiplex assays with any combination of R-PLEX analytes, as well as R-PLEX plus U-PLEX analytes can be developed on U-PLEX MULTI-SPOT plates. To learn more about the advantages of R-PLEX products click here. 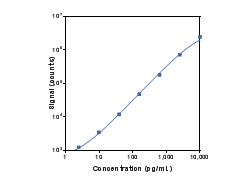 Calibration curve for the R-PLEX Human RANTES Antibody Set was assessed and representative data is presented below. Description - RANTES (regulated on activation, normal T cell expressed and secreted, SCYA5, SISd, TCP228, CCL5) is a member of the CC family of chemokines that are chemotactic for T lymphocytes, monocytes, basophils, and eosinophils. RANTES is expressed in fibroblasts, platelets, and T cells. It plays an active role in the immune system by recruiting leukocytes into inflammatory sites. RANTES is also involved in the progression and metastasis of some malignant tumors. Phase II study of a neutrophil elastase inhibitor (AZD9668) in patients with bronchiectasis. Safety, tolerability and pharmacokinetics of a human anti-interleukin-13 monoclonal antibody (CNTO 5825) in an ascending single-dose first-in-human study. The p38α MAPK regulates microglial responsiveness to diffuse traumatic brain injury.